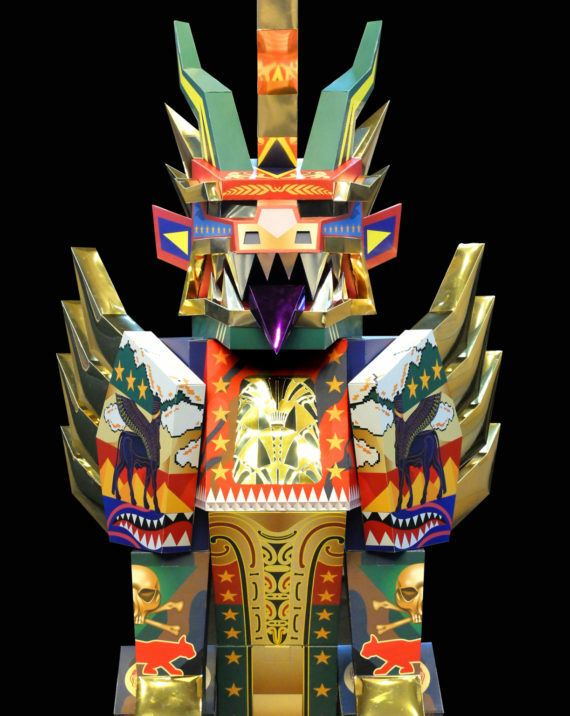 An upcoming solo show exploring humanity’s ongoing fascination with myths – from ancient Greek legends to modern superheroes and ‘fake news’. Opening July 6 at 20-21 Visual Arts Centre. Supported using public funding by the National Lottery through Arts Council England. The above image is a screenshot of the acceptance letter for my MYTHOMANIA project grant. It was an amazing moment to click on the button within the Arts Council’s Grantium system and see the word “Congratulations”. Once you see that word, you know it’s good news, and suddenly everything changes. I’ve been wanting to submit an Arts Council application for several years now. I’ve actually started, and nearly completed, at least two other applications…but for some reason the project didn’t seem right, or circumstances changed – so I never submitted them. So it was with great relief that this project, which DID feel right, was given the go-ahead. The project itself didn’t begin with the Arts Council application; it actually started a few months earlier, in October, when I was approached by Janine Parrish and Dominic Mason of 20-21 Visual Arts Centre in Scunthorpe, who asked if I would be interested in presenting a solo exhibition in one of their galleries. Of course I said yes – but in order to make it happen it was necessary to get a significant amount of funding. The funding was for the three key things necessary to creating new work: materials, an artist’s fee, and all of the peripheral elements such as transport, promotion, etc. I’ve created lots of artwork with very little (or sometimes no) money…but to really make the best work possible, it’s inescapable that you need to have a decent amount of funding. This is especially true when you’re making new, exploratory work, with lots of experimentation, trial and error. So with help from Janine and Dominic, I spend about a month and a half putting together the Arts Council submission. Earlier, I had written a project proposal for 20-21 Visual Arts Centre, explaining what I wanted to do, and sketching out some of the artwork ideas. Once their committee agreed to the plan, I used this as the basis for the Arts Council application. For those who have never written one before, the application process requires a significant amount of time and work; each individual question asked is relatively short (often as little as 1500 characters) – but cumulatively it is a lot of writing. What’s more, the writing of the application itself forces you to think through the many aspects of your project, clarifying the ideas, costs, outcomes and benefits…so that by the time you’ve completed the application, the project is actually much stronger than what you started with. This is something I hadn’t really anticipated, and although I found the writing of the grant very time-intensive and at times frustrating, it was definitely worth taking the time to really think carefully through each aspect of the project and make it as strong as possible. It also helps to have support from other people when putting the application together. I had tons of support from Janine and Dominic at the gallery, who were able to provide detailed figures on previous visitor numbers and other impact statistics, as well as offering ‘in kind support’ and cash funding. My wife Sara was also invaluable, and read (and re-read) my application – suggesting changes that made it stronger, or clarified aspects of the proposal to make it easier to understand the ideas and intention. As an artist I’m often putting together proposals and applications…so I’m used to just writing and submitting them myself – but I can definitely say that, in the case of the Arts Council application, it helps to call on the support of others. …And it all paid off. It suggests on the website that applications take 6 weeks for a decision – but I got my response in 5 weeks. During that time, I was still preparing to create the proposed work (since the show was going to move forward with or without the funding)…but the Acceptance Letter made a huge difference in terms of my feelings towards the project. On one hand, it provides a kind of validation for your work and project: it suggests to yourself (and others) that your project is meaningful. And on the other hand, it has real, practical benefits – namely it means you can take the time to make the best work possible, and finance the production of work that would be impossible otherwise. 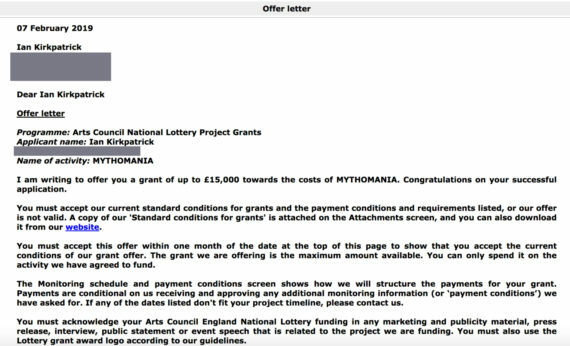 So – although the MYTHOMANIA project theoretically began in October, when I first met with Dominic and Janine at 20-21 Visual Arts Centre in Scunthorpe, it actually started on 7 February, when I clicked on the decision button, and got the letter above.